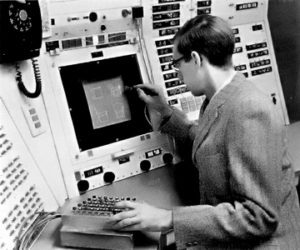 The first machine I ever programmed was a UNIVAC 1, in 1957, as an undergraduate at Harvard. Although I did not know it at the time, Sperry-Rand Corporation had given this machine to Harvard the previous year. Apparently not even Harvard could afford it. In 2014 dollars it cost about $7 million. In a previous post I said “… in my Junior year one of the professors decided to offer a noncredit course in programming.” Since then I have corresponded with the professor who taught that course, Peter Calingaert, who tells me that it was a for-credit course, ES101. I guess that I enjoyed it so much I didn’t remember it as work. As the last assignment in this course, we each had to write a program for the UNIVAC to find the square root of a number. The machine was down (probably a burned out vacuum tube) during the half hour that was scheduled for our class to run our programs, and the machine was so tightly scheduled that we could not get another time to try our programs. So Prof. Calingaert manually tested our programs. Mine had a bug: it blew up for negative numbers. The UNIVAC was so large (14 feet by 8 feet by 8.5 feet high) that to repair it you opened a door in the side and walked in. It used 5200 vacuum tubes, which made it somewhat unreliable as the tubes frequently burned out. It was cooled with chilled water from a refrigeration plant on the floor below. The two most interesting features of this machine were the memory and the drum storage unit. The memory consisted of tanks of mercury with speakers at one end and microphones at the other end. Data was stored as pulses of sound traveling through the mercury (sound travels slowly in mercury). The external storage was on magnetic tapes and on the magnetic drum. This was a section of steel sewer pipe, about 5 feet long and one foot in diameter, machined to be precisely round, coated with magnetic oxide, which spun at a high speed. Data was written and read with a device that travelled the length of the pipe on a screw thread. If that spinning sewer pipe had ever gotten loose it would have wrecked havoc. The second machine I programmed, in graduate school, was an IBM mainframe. i don’t remember the model number and I don’t think I ever saw the machine. I wrote my master’s program (in artificial intelligence), in the LISP language, on punched cards which I submitted to the machine operators. Twenty-four to forty-eight hours later I got back the results of my run. Frequently the run failed because my LISP program had unbalanced parentheses (LISP relies heavily on parentheses). This whole experience was so painful that I decided my Ph.D. thesis would not require using a computer. My next machine was the most interesting of all: the Lincoln Labs TX-2, named “TX-2” because it was the second transistorized machine invented at M.I.T. I had a summer job writing a software program to analyze software programs. This was great fun. The TX-2 was a hands-on machine. Programs were prepared ahead of time on punched paper tape, but you ran your program, and debugged it, sitting at a console with keyboard and two monitors. In this it was a very modern machine. The TX-2 was very modern in that it had ferrite core memory, quite capacious for its time. The TX-2 probably was the first machine to use this memory technology which later became commonplace, until t was replaced by semiconductor memory. The memory was big enough to hold 90 seconds of music from the fourth movement of Beethoven’s Ninth Symphony, in stereo. I know that because occasionally I would play the music, which was in the machine because M.I.T. Professor Amar Bose was doing the research on sound that resulted in his famous Bose speakers. Probably because of his research the TX-2 console incorporated two high-quality speakers. During the day one could only schedule a half-hour at a time on the TX-2, and the schedule was fairly booked. However at night one could schedule 9PM – 7AM as a single block. So I did most of my work there at night, working until I was too tired to continue, usually about 2 or 3 AM. One time after my work I was so tired that as I was driving out of the parking lot I ran right over a stop sign. Unfortunately my car, a Corvair (and a mistake) had the oil pressure sensor hanging off the bottom of the engine. I sheared it right off and all of the oil poured out of the engine. Needless to say I did not drive home that night. Curiously, nobody at Lincoln Labs ever talked to me about the ruined stop sign. My next computer was a GE 635 mainframe at Bell Labs. That, like the IBM mainframe, was a batch processing machine. Normally programs were submitted to an operator. However, since I and my team were building an operating system (a time sharing system) we were able to work hands-on. Like the TX-2, this machine was available to us only at night, so again I found myself working every night until 2 AM or later. My most memorable incident with that computer happened late one night. Bell Labs’ Whippany location, where we worked, was a security classified location so at night there was a military guard in the computer room with us, to make sure we did not wander into restricted areas. One night my program started to malfunction and spin a tape that should not have been spinning. So I ran across the room to turn off the tape drive. After switching off the drive I turned around only to see the guard with his gun pointed at me. “Don’t EVER do that again,” he said. Today, of course, I am using a machine that is hugely more capable than those early machines. Even my iPhone is many times more powerful by any measure. But those old machines were more fun. This entry was posted in Rudd's Blog, Uncategorized and tagged Bell Labs, computing history, Harvard, M.I.T., TX-2, UNIVAC. Bookmark the permalink.